100% refund if we unable to unlock your mobile device. Send us IMEI number of your device after purchase via message (press *#06# on your phone keypad to get the correct IMEI number (don't use IMEI printed on the phone box), phone model (like Grand Prime / S8+ etc. ), carrier and country the phone is locked to. 20% fee will be charged for restock if order purchased by mistake, wrong IMEI, wrong carrier or wrong device! It's a kind of digital items and it can't be cancelled once process is started or completed! Buying this item, you confirm you have read and agree by these terms! Quality can only be guaranteed if you purchase "Unlocker" lots. Unlock your device without losing Manufacturer's Warranty! 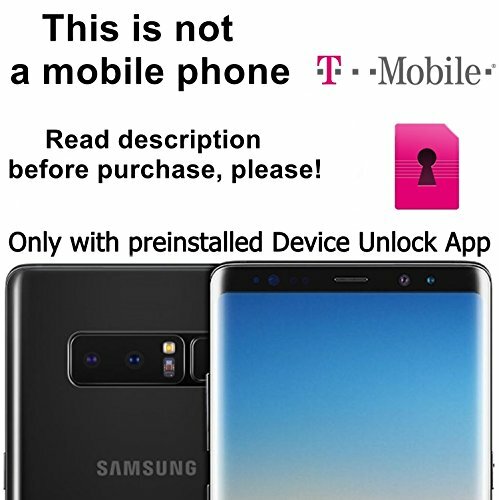 MODELS SUPPORTED: Unlock service from Tmobile carrier for Samsung Galaxy J7, On5, S7, S7 Edge, Core Prime, Grand Prime, S8, S8+, Note 8, 4 and other models. IMEI's SUPPORTED: unpaid bills, blacklisted, lost, stolen, barred, financed, in-contract, clean, out-of-contract. Blacklisted / lost / stolen devices won't work in the USA even after successful unlock procedure. You'll have to use it abroad or sell it, we won't refund in this case. FREEDOM: No more mandatory payments and special conditions you forced to observe. If you aren't satisfied with terms and conditions of your current mobile carrier, just switch to another one. No limits! BENEFITS: Save money on roaming when you travelling. Devices become more attractive for buyers as they are no longer restricted to be used on a single specific mobile carrier. LEGAL: Thanks to changes in the laws in the US in 2014, unlocking a cellphone is now completely legal. The Unlocking Consumer Choice and Wireless Competition Act was made official by President Obama in August 2014. If you have any questions about this product by Unlocker, contact us by completing and submitting the form below. If you are looking for a specif part number, please include it with your message.